FREE LIVE STREAM: Wrestling Observer Live with Bryan Alvarez and Mike Sempervive! SmackDown takes place tonight at the Intrust Bank Arena in Wichita, Kansas. Matches for tonight include Rey Mysterio vs. Andrade in a 2 out of 3 falls match, Mandy Rose vs. Naomi and The Miz vs. Cesaro with their tag team partners in their respective corners. Mr. McMahon will also moderate a face-to-face between WWE champion Daniel Bryan and AJ Styles ahead of their match this Sunday. WWE 24: WrestleMania 34 will air after the Royal Rumble this Sunday. WWE 2K19’s Rising Stars DLC pack is out now. Performance Center trainees were asked their Royal Rumble predictions. 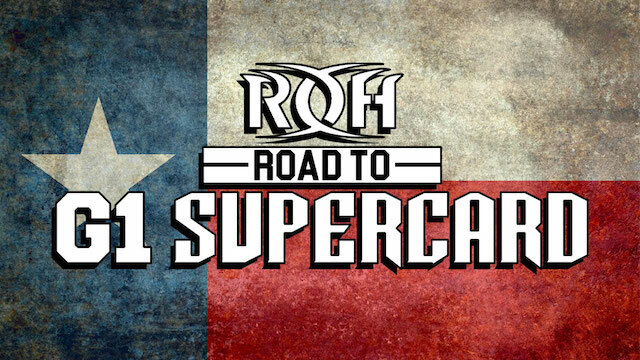 The Tag Wars semifinals and finals will take place at the Road to G1 Supercard on January 26. The winners will get a shot at the ROH tag team titles and will be a part of the NWA’s Crockett Cup tournament on April 27. Marty Scurll will face either Mark Haskins or Jonathan Gresham on the same night. Who he will face will depend on who advances in the Tag Wars tournament. MLW announced that internet host GoDaddy will be sponsoring future events, starting with next Saturday’s MLW Fusion live event. PWInsider reported that Roxanne Biggerstaff, who briefly worked for Impact Wrestling as a valet for the Disciples of the New Church, passed away Friday after being found unresponsive in her home. Impact has renewed their deal for Mexico with MVS Comunicaciones/MVStv. Impact Wrestling uploaded Hiroshi Tanahashi vs. AJ Styles from Final Resolution 2006 to their YouTube page. Congratulations to Masato Tanaka, who is now a father to twins. Leva Bates is warning people on Twitter that there are fake accounts pretending to be her that are asking for money. Colby Covington is still upset that despite being interim champion, he was snubbed for the title shot against Tyron Woodley in favor of Kamaru Usman. Holly Holm told MMA Fighting that if she were to face Amanda Nunes, she would want to do it at bantamweight, not featherweight. UFC will return to Miami for a Fight Night event on April 27. Edson Barboza will face Justin Gaethje on March 30 in Philadelphia. Gian Villante vs. Michal Oleksiejczuk is now set for the UFC Fight Night show in Prague, Czech Republic on February 23.